Throughout the year 2015, our Community at Taizé is celebrating the 75th anniversary of its foundation, and invites people to remember its founder, Brother Roger, 100 years after his birth and ten years since his passing to the life of eternity. 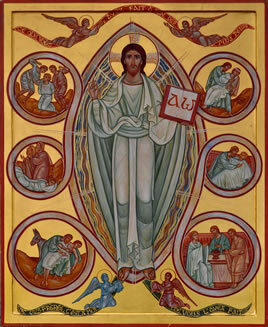 The theme especially proposed for reflection this year is “Towards a new solidarity”; and the Community has decided to have an icon painted telling the story of the Good Samaritan. This Bible text from chapter 10 of St. Luke’s Gospel gives a clear example of solidarity put into practice. The icon was made by the Icon Workshop of St John of Damascus in France.